Providing the community with Quick, Courteous, and Compassionate Care Since 1972, Kirk’s EMS, has continually distinguished itself as a leader in providing routine and emergency medical services. As the needs of the community and the patient change, we continue to introduce innovative programs to ensure the highest level of care is available to everyone in our service area. For over 42 years, we have made great strides in developing strong, long-term relationships with our patients and the community. Our ability to maintain policies and procedures that meet and exceed the changing needs of the health care system has enabled us to establish and maintained relationships that are unrivaled in our industry. We remain focused on providing prompt, high-quality patient care at the Advanced Life Support and basic Life Support levels. Our employees work diligently to achieve new goals while maintaining the highest standards of care. You can depend on Kirk’s Ambulance Service for all of your medical transportation needs. 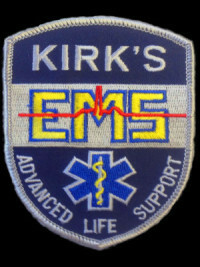 Since 1970, Kirk's EMS, has continually distinguished itself as a leader in providing routine and emergency medical services. As the needs of the community and the patient change, we continue to introduce innovative programs to ensure the highest level of care is available to everyone in our service areas. For nearly 40 years, we have made great strides in developing strong, long-term relationships with our patients and accounts. Our ability to maintain policies and procedures that meet and exceed the changing needs of the health care system which has enabled us to establish and maintain relationships that are unrivaled in our industry. We remain focused on providing prompt, high-quality patient care at the Advanced Life Support and Basic Life Support levels. Our employees work diligently to achieve new goals while maintaining the highest standards of care. You can depend on Kirk's Ambulance Service for all of your medical transportation needs.